It looks like all those rumors about a MacBook Pro refresh coming Thursday instead of in early March are true. The online version of the Apple Store was down this morning and, just in time before the big reveal, a photo has leaked online showing the specs for the new 15-inch version of the refreshed MacBook Pro. 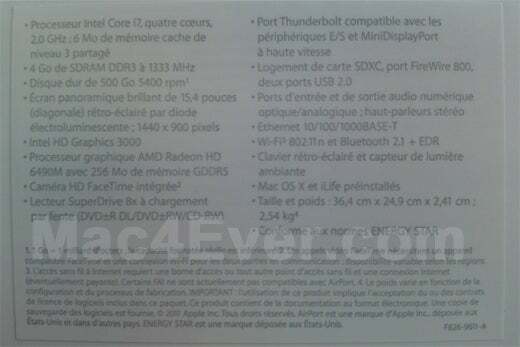 The French-language site Mac4Ever (translated link) posted a photo it claims is the new 15-inch MacBook Pro's product box showing the purported laptop's new specs. The latest MacBook Pro will reportedly include a 2Ghz Intel Core i7 quad-core processor, 4GB DDR3 RAM, a 500 GB optical drive, 1,440-by-900 display resolution, two USB slots, a SDXC card slot, a FireWire 800 port, an 8x Super Drive, a FaceTime HD camera, and an AMD Radeon HD 6490M graphics card with 256 MB of VRAM. The computer weighs 5.6 pounds, according to the screenshot. It's not clear what the specs would be for the 13- and 17-inch MacBook Pros. The box also mentions something called a Thunderbolt port, which is rumored to be using Intel's Light Peak high-speed connection technology that will supposedly rival USB. The box says this port is compatible with peripherals and also acts as a MiniDisplay port, backing up rumors that appeared online on Wednesday. Missing from the purported specs is any mention of the previously rumored hybrid SSD-optical storage system. Under this scheme, the OS X operating system would sit on the SSD for a faster start-up time while file storage would be handled by the larger optical drive. It's not clear when Apple will open up its online store again, but if it's waiting to unveil refreshed MacBook Pros, it may have to wait until later today. Intel is hosting a press event Thursday at 10 a.m. Pacific time in San Francisco to launch its Light Peak technology that is purportedly used in the new MacBook Pro's Thunderbolt technology. Only a few hours until we know for sure.